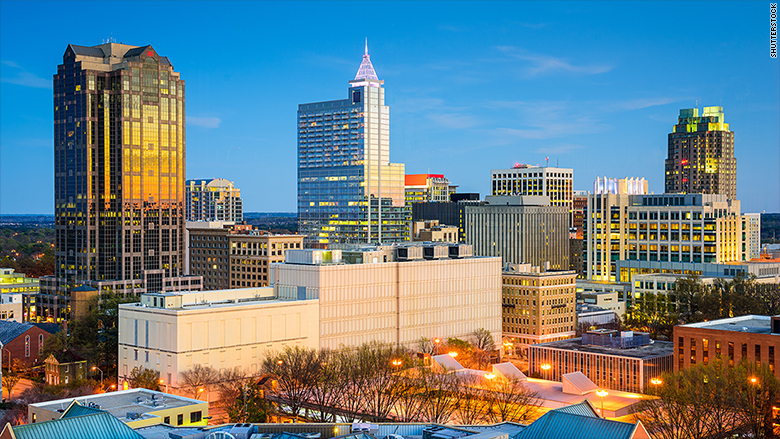 The Raleigh-Durham area in North Carolina is home to the famed Research Triangle Park, where a host of health and technology companies have set up shop. It's also known for its schools -- Duke University, North Carolina State and the University of North Carolina. And it's a great place to find a job. Among the 50 largest metro areas, Raleigh ranked highest in terms of hiring opportunities -- i.e., the ratio of active job openings to the number of people living there, according to a new report from Glassdoor. It ranked fairly high in reported job satisfaction as well. "Raleigh has long held a reputation for tech companies looking to flee the expensive Northeast corridor," said Glassdoor chief economist Dr. Andrew Chamberlain. Companies like IBM, Cisco, Wells Fargo and SAS have chosen to have major offices there. What's more, Chamberlain said, the universities are feeding skilled workers to employers. "Couple this with Raleigh's affordable homes, it's no surprise that Raleigh stands out as the best city for jobs."